We welcome back Louis Maughan, who introduces us to Wembley, a new stalwart in doing the 92. Louis covers some of the basics, whilst also exploring what it is for Spurs to be playing at a home away from home, White Hart Lane. I’ve been to Wembley a few times, but only to see England friendlies and one-sided qualifiers. Every season I dream of watching my club play a major final at the National Stadium. These dreams have usually faded and died, however, before the start of Spring. Watching this eagerly awaited London derby might just be the closest I get to witness a Wembley showpiece. Getting seats at Spurs this season should be fairly straightforward as it looks like most, if not all games, will go on general sale. The majority also won’t be classified as ‘high risk’. This is great for groundhoppers or fans that just want to see a ‘top-6’ team play live. So, what was seeing a Premier League game at Wembley like? Driving to Wembley isn’t really an option, but there are three stations within walking distance of the stadium. Wembley Central is a long walk and Wembley Park can get very busy, so we opted for Wembley Stadium station. It can be reached via a 10-minute train from Marylebone. These trains aren’t too busy as they run regularly on match days. 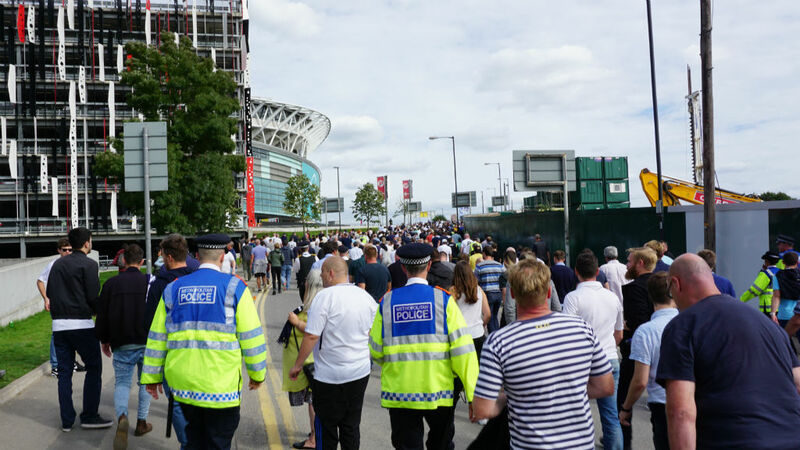 Fans walking from Wembley Station. Home to Tottenham Hostpur. Food and drinks are generally overpriced and not that great inside Wembley, so we didn’t give much thought to braving the queues on the concourse area. Unfortunately, all of the programmes had sold out which was a little disappointing. Spurs offer an online version, but it would have been nice to have a keepsake from Wembley’s first Premier League game. 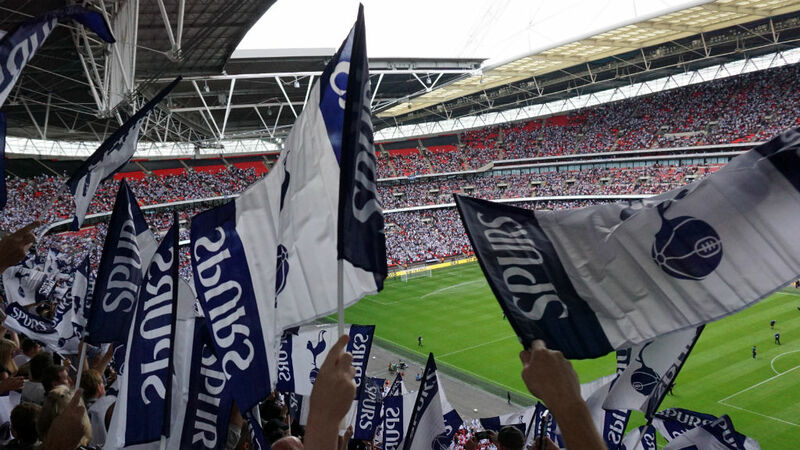 Spurs fans fly the flag as Wembley is welcomed to the 92 for it’s first league game. 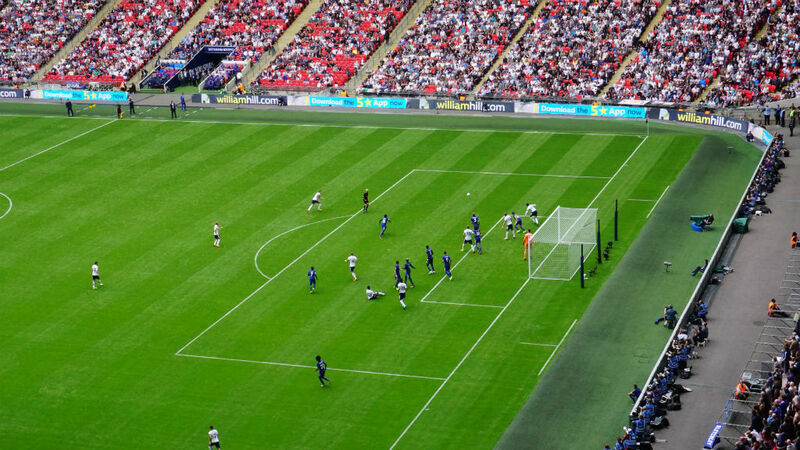 Tottenham attacking the Chelsea goal. Atmosphere 4/5: Fluctuated a little during the tense moments, but when it was loud it was very loud. Location 3/5: Wembley is easy to get in and out of, and there were only around 20-30 minutes to get home. Value for money 3/5: £45 is not too bad for a ‘top-6’ game, but food and drink were pricey as expected. Programme 1/5: Thought about leaving this one blank. There should, however, have been more copies available on the day. 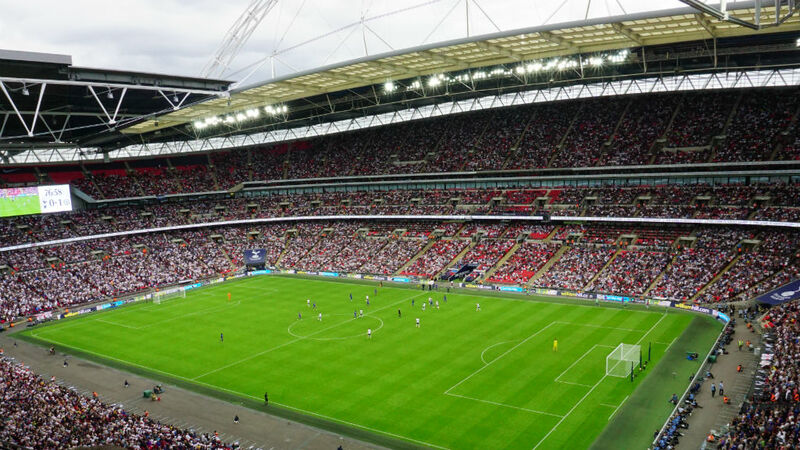 Character 2/5: You know what you get with Wembley really, and it’s only a temporary home for Spurs. Stewarding 5/5: Well organised and friendly. Overall 3/5: Great as a one-off venue to see two great sides, but a little pricey and doesn’t feel like a team’s home ground (because it isn’t one).